While Kappan authors have generally supported desegregation, opinions about how to desegregate have varied and evolved over time. The Kappan archive offers a window into history as it happens, a fact that is especially clear when it comes to the issue of segregation. In our pages, educators and scholars have debated whether schools should desegregate, how desegregation laws should be enforced, and what actions are appropriate in furthering the cause of equality. For example, in the years before the 1954 Brown v. Board of Education decision, Kappan published a number of articles debating whether Black and White students should be integrated or remain in separate schools. Most authors held that the doctrine of separate but equal was clearly a failure, as the NAACP’s Leslie Perry argued in his April 1949 article, “Pattern of discrimination in education,” in which he wrote of Black Americans being beaten for trying to start a school, White retaliation against public officials who supported equal funding for Black schools, and the poor facilities provided for Black children. What were these “facts” that Perry supposedly had left out? Conger cites an unnamed Black dissertation candidate who argued that impoverished White people were being taxed to pay for Black schools and an article from more than 30 years earlier (possibly published in Collier’s) that described racism as a serious issue best left to the South to work out on its own. The gist of Conger’s argument — expressing support for desegregation in theory, while asserting that it shouldn’t be imposed on local schools by outsiders — has been repeated many times across the decades, and it will likely be familiar to readers today. Immediately after the Brown decision, the conversation shifted from whether to desegregate to the question of how to do so. Notably, in Kappan’s May 1956 special issue on “Problems of school desegregation,” authors considered a number of ways in which it might play out. In “Integration: A human relations problem,” Guy Johnson and Richard Simpson predicted that after an initial period of shock, in which states would seek to enact (likely ill-fated) policies to limit integration, a period of (likely short-lived) violence would ensue. They expected that some measure of school integration would eventually become the norm, but achieving economic equality would likely require an ongoing, though perhaps less contentious, struggle. In the same issue, Maxwell Brooks (“The new inequality”) worried that allowing for gradual desegregation might give Southern states time to find ways around the law by, for example, starting publicly subsidized private schools. Indeed, he proved to be prescient, as schools across the South soon began to close rather than desegregate. One of the most notorious examples, Prince Edward County, Va., which closed for five years, was the subject of a May 1964 Kappan article (“A study in infamy: Prince Edward County, Virginia,” by Rupert Picott and Edward Peeples, Jr.). The closure of schools prompted Phi Delta Kappa to abandon its previously neutral stance regarding how best to desegregate. Five years earlier, in his opening editorial in Kappan’s January 1959 issue (“Desegregation? Or no public schools”), Stanley Elam had noted that while the morality of desegregation was a “settled” matter, PDK had assumed no responsibility to advocate for specific policies and practices. However, he went on, the threat to free and public education presented by school closures was too great for the organization to remain silent. The editorial urged PDK members to join the Committee for Public Education, an organization committed to keeping public schools open but neutral on the question of integration. Still, Elam closed the 1959 editorial with a comment that seemed to privilege the funding of public schooling over racial justice: “[F]ree public education must not be allowed to fall victim to the upward surge of an under privileged minority” (p. 153). However, by May 1964, Elam was urging teachers to take an active stand against racism, not just as individuals but as a profession. In “What have we done lately?” he observed that “as organized groups . . . teachers have probably suffered from over-caution and lack of imagination” (p. 361). The May 1966 special issue of Kappan considered where efforts to desegregate stood in light of the Civil Rights Act of 1964. As predicted by earlier writers, progress was proving to be slow. Herbert Wey (“Desegregation and integration”) described the many obstacles to progress. Among these were that fact that the Black students who benefited most from desegregation tended to be those who were more economically well off, while programs designed to assist needy Black preschoolers were criticized for being segregated. Wey urged schools to reimagine their curricula, avoid grouping students by race and ability, and consider multiple ways to assess student intelligence (all familiar proposals to today’s educators). Not all Kappan authors agreed. In that same issue, Alexander Bickel (“Desegregation: Where do we go from here?”) argued that pushing too hard to integrate might cause White parents to flee into all-White neighborhoods or into private schools. And efforts to prevent these movements by, for example, withdrawing financial support from private schools would end up disproportionately affecting poor rural Whites who had fewer resources and housing options than their better-off counterparts in the cities. This inherent unfairness against rural people was likely to backfire, Bickel wrote, “fueling the politics of George Wallace.” Better, he suggested, to work hard to improve Black schools, many of which were beloved by their communities, than to attempt to integrate beyond what a community would tolerate. School segregation did not end with the civil rights era, of course, and Kappan authors have continued discussing solutions from the 1970s to the present day. In May 1972, for example, an issue titled “The wayward busing issue” discussed the role of busing in improving the racial diversity of schools, despite lack of diversity in housing. When the issue was published, President Richard Nixon had called for a moratorium on busing, and Florida had voted for a constitutional amendment against busing while, at the same time, voting in support of integration. So, once again, while integration received theoretical support, practical efforts were met with resistance. Recognizing the controversy, Ralph Spence noted in his guest editorial that opened the issue that “parental concern over busing is understandable. We would not want parents indifferent about the schooling of their children, but we want them also to remember their responsibility for helping other children achieve this same quality” (p. 573). With this in mind, Bates suggested education leaders focus not just on whether students of different races are educated in the same schools but also on ensuring that students in majority Black or Latinx schools are receiving a high-quality education. Of course, significant movement toward racial equity will require more than school boundary-line adjustments or improved conditions in schools with large populations of minority students. Progress also requires changes in attitudes. Carl Grant, guest editor of the September 1990 Kappan, observed in his article (“Desegregation, racial attitudes, and intergroup contact: A discussion of change”) that the “color line” problem W.E.B. DuBois identified over a century ago as “the problem of the 20th century” would persist well into the 21st: “Indeed,” he wrote, “I believe that the problem will be exacerbated, because this society is not yet preparing itself to affirm the different groups of color” (p. 28). As the articles in this issue (and daily headlines) attest, we as a nation are still grappling with how to live and learn together, how to embrace our differences rather than run from them. Today, the problems of the color line remain. How can we learn from our history and tear down all manifestations of the color line so that all have the opportunity to succeed? Citation: Preston, T. (2019). 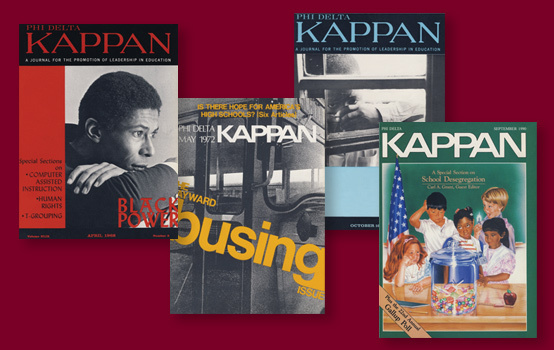 A look back: Kappan authors on desegregation. Phi Delta Kappan, 100  (5), 5-7. TERESA PRESTON (tpreston@pdkintl.org) is managing editor, content, of Phi Delta Kappan.